Walk in and immediately feel the peace and tranquillity it inspires. It may be unusual, but it is comfortable, spacious and is an ideal retreat from a busy life amongst the fumes and bustle of the city. Furthermore, there is a hot tub in the garden, where you can lie and soak, gazing at the nearby hills. Book Xidong on-line or check availability here. Xidong Cottage is a Japanese haven with a Chinese name meaning ‘Rising Sun’; an oriental retreat in the heart of Shropshire. Sleeping two, it is the perfect setting for a romantic weekend. 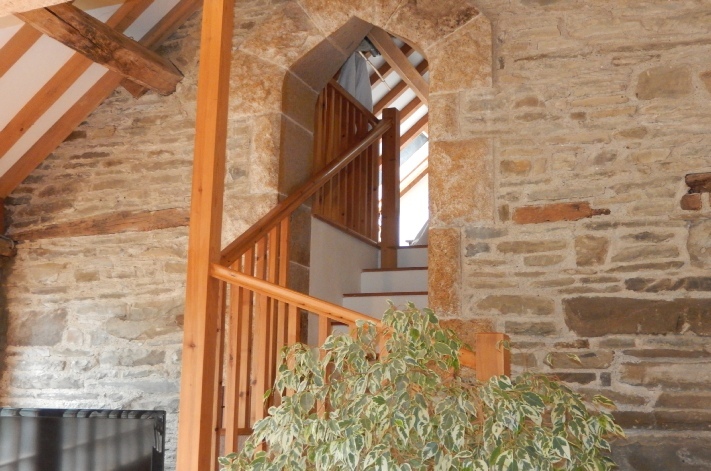 It is converted from an old cowshed and has a private garden terraced with local stone and featuring an ornamental pond and waterfall in the process of construction. 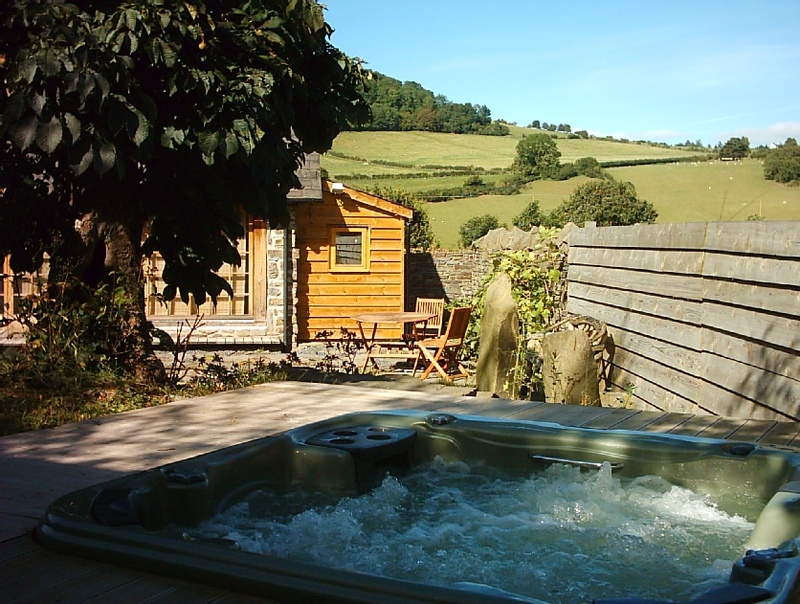 There is also a luxurious hot tub (read about it here), which can be used at any time of year and from which you can see the beautiful hills and woodland surrounding the property. You enter the cottage through a cloakroom, which houses a washing machine, tumble drier and small freezer and has space for dirty boots and wet coats. The large main room is open to the eaves and gives the feeling of space and luxury. It is decorated in a Japanese style using natural materials, particularly wood, where possible. There is a locally made, bespoke oak table and chairs and a seating platform with futons and large cushions, which arrange into whatever comfort you desire! Also, recently added lounging chairs complete your comfort. Large triple doors open out onto a small wooden deck and garden with it's hot tub. A stone stairwell leads up from the living room to a little mezzanine bedroom with a low sloping ceiling. Don't be alarmed, you won't be expected to sleep on a futon on the floor! 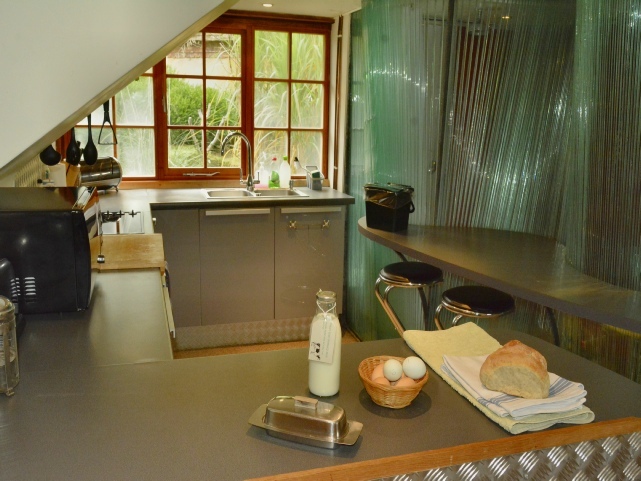 There is a modern well equipped kitchen with an extraordinary and unique curvy green glass division wall, which hides a slightly quirky but effective ‘wet’ room. 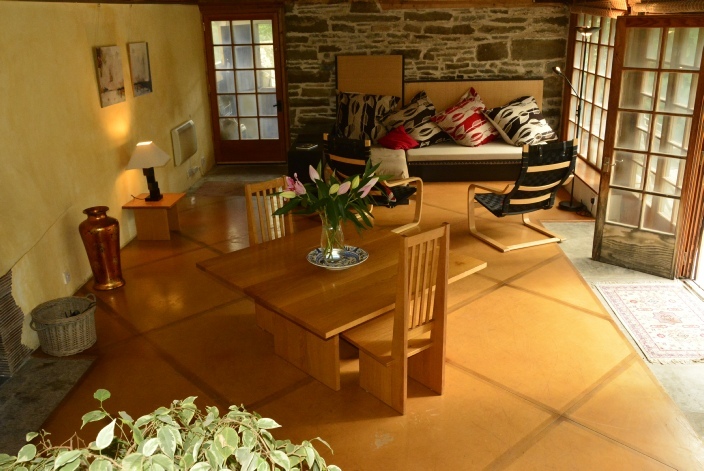 Electric under floor heating keeps the cottage at a constant warmth and a wood burning stove can be lit to boost the evening temperatures, however please do not expect to be able to wander round in t-shirts in winter. It is an old stone building, this is the countryside and if the last three winters are anything to go by, you will need extra jumpers! 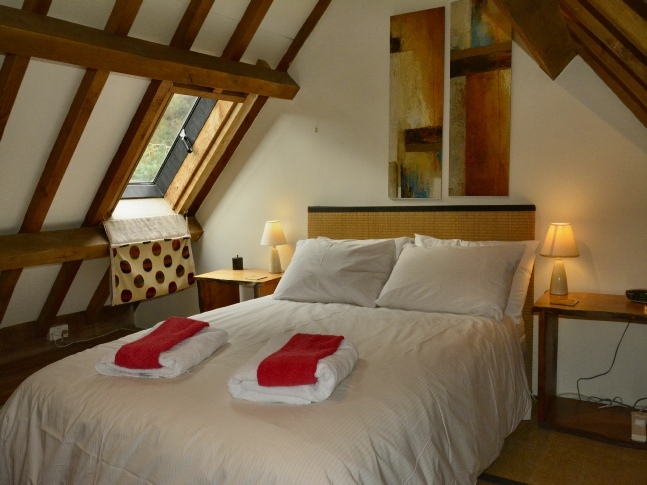 All bed linen and towels are included in the price and as there is no mobile phone signal here, emergency or important phone calls can be made from the farmhouse. Babes in arms are welcome (please bring a travel cot), but the cottage is not suitable for toddlers because of the ponds and hot tub in the garden and there are no sleeping arrangements for older children. The cottage is not suitable for wheelchair users. Our hot-tub recently developed a leak, which fortunately was easily remedied. The service engineer who came to mend it said that it was in really good condition given its age… this is good to know as we take great care to use the right chemicals at the right levels and change the filters and water as frequently as is practical. The hot tub is enjoyed by all our guests and often gets a mention in the reviews. It is also a large factor in our guests’ decisions to come to stay in Xidong. It is a great boon. A fact of life is that the water cannot be changed after every guest; there is not enough time between changes of visitor. It is therefore very important that everyone using the hot-tub uses it with the next guests in mind; after all, no one wants the evidence of the previous people’s dirty water. With the tub being outside, the water is prone to get leaves, twigs and soil brought in on people’s feet (and falling in off the trees), so the more careful you are about cleaning the debris off your feet before getting in, the better. Being in the hot-tub may feel like being in an outdoor bath, but it is not an alternative way to wash! Body lotions, oils, hair product and soap are all detrimental to the health of the water. Keeping your hair dry is a sensible precaution, not only because hair clogs the filters, but sitting in the tub with a wet head is bad for your health. One of the most surprising things some of our guests do is allow their dogs in. This may seem to be a reasonable thing to do for some dog-lovers, but it takes a lot of chemical and extra filter changes to clear the water. The chemical levels and colour and condition of the water are checked every week before new guests arrive; there is no reason why the water shouldn’t be in more or less the same state when they leave. We have had some instances when guests have taken it upon themselves to alter the setting on the bromine dispenser. This does not make the water cleaner or healthier; it just upsets the water balance and can be damaging to your health and the components of the hot-tub. Other things which have been tampered with in the past are the temperature and the controls. There is a reason it is recommended that the temperature is kept at 38oC. For your own health, it is advisable not to stay in the hot tub for more than 20 minutes to half an hour and the temperature kept below 38oC to prevent hyperthermia (getting too hot), this is a potentially dangerous condition and it is not easy to tell you are suffering until it is too late. Some of the control knobs are missing. This is due to the fact that there was a limit to how far they turned and some people are simply not content with turning them a little! Result – broken control! The same goes for the jets. Some turn, some do not; none has to be forced to turn – that just breaks them. Other things which affect the condition of the water are spilled drinks and body fluids. Obviously spilling your drink is not something you would want to do or do deliberately, but care can be taken. Body fluids are inexcusable!!! Loved it here (again) - beautiful weather all week (again!) - great location too! We went on a walk around the fields following the public footpaths on the map provided at Xidong which had fab views of the surrounding areas!! …visited Ludlow Castle which is less than an hour away and we went to Hampton Court Castle which we highly recommend! Love love loved our stay in Xidong Cottage. The remote location was wonderful to get away from it all. The cottage itself is beautiful and very well equipped. The lovely welcoming touches of local milk, eggs, butter and fresh bread was so thoughtful and gratefully received. We took advantage of the private hot tub which was a perfect addition to our stay, star gazing in it at night was fantastic. Julia and I had the most amazing time…. …We loved having a walk around and felt very welcome without being watched, but felt if we needed anything you were there which was lovely, so well done for a mega balance.